An Coimisiún le Rincí Gaelacha is hosting the 2012 Irish National Irish Dancing Championships, Craobhacha Rince Naisiunta na h'Eireann, in Dublin this weekend. 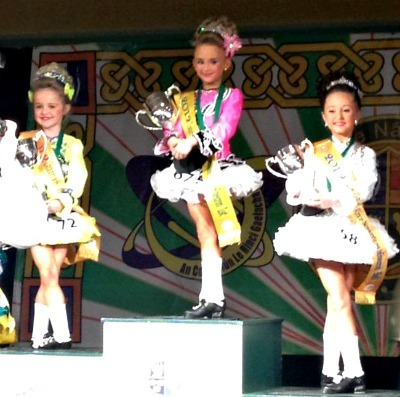 Thousands of competitive Irish dancers are competing over three days at CityWest. Solo competitions for boy and girl Irish dancers from age 7 up to and over 20 years old are taking place in ballrooms there alongside team events which include girls' and ladies' ceili, mixed ceili and figure competitions. Early results are in! Congratulations to 2012 Irish National Irish Dancing Champion for Girls under 7 Caoimhe Devlin from McConomy Bradley, Champion for Girls under 8 Erika Long from Croghan-Greene, Champion for Boys under 7 Andrew Stack from Staic and Champion for Boys under 8 Tiernan Fahy from McDonagh-Byrne. These four young dancers represent the Ulster, Munster and Connaught Regions of Ireland. Congratulations also to 2012 Irish National Ceili under 11 Champions from Mona Ni Rodaigh in the Ulster Region.